On the night before New Year’s Eve, Magic Kingdom presented the same fireworks show as on New Year’s Eve, but with a somewhat smaller crowd. The show includes fireworks shot off at Cinderella Castle, the launch site to the north of the park and in the Seven Seas Lagoon to the south. During some parts of the show, from the perspective of the hub, there are fireworks encircling the crowd. 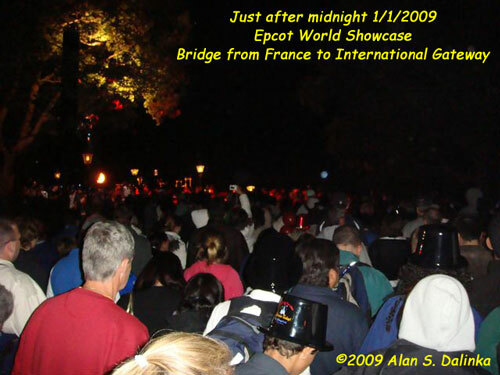 On New Year’s Eve, Epcot showed Illuminations twice: once fairly early for the “little ones” and again at 11:40 p.m. The early show ends with the “Christmas Tag” and the later show (which is the one in the video) concludes with a tag leading up to the huge display at and after Midnight with fireworks shot from behind many of the country pavilions in the order the countries celebrated the start of the New Year.